I was fortunate enough to read an advance copy of Brain Gain: How Innovative cities create job growth in an age of disruption. The book does something which is too often overlooked: Making the case that broadband investments have to be thoughtfully linked to broader community and economic development goals. The book is written by the founders of the Intelligent Community Forum, Robert Bell, Louis Zacharilla, and John Jung. I have known these guys for years, and have served as a juror for the annual ICF "Intelligent Community" awards (Note: I don't get paid for that work). In my experience, the communities that take the time to set a vision for the community are much more likely to see their broadband investments have a long term impact. If a community cannot answer the question, "What do we want the community to look like in ten or fifteen years?" then throwing some fiber in the ground is not likely to help much. The book provides an insightful analysis of eighteen communities that have taken the time to ask the right questions about the future, have allocated the right funding and human resources to put the right infrastructure in place, and have given their efforts time to mature. There are a lot of good ideas and concepts in this book. Back in the nineties, some crackpot (okay, me) claimed that symmetric broadband connections were going to be essential because content creation was going to occur everywhere, not just at the office or in denizens like Hollywood. And for the last twenty years, just about everyone who works at a cable or telephone company has outright scoffed at the notion and/or patted me on the head and told me to go back to the wilds of the Appalachians. Verizon has just announced that they are rolling out symmetric FiOS connections. And I think the Washington Post, where the article appeared, is exactly right: it is community broadband efforts, where symmetric connections are readily available, that are creating pressure on the incumbents. A technology reporter got Comcast's attention after he posted a recording of his attempt to cancel his service with the cable giant. As a Comcast customer, I would say that their customer service has improved somewhat over the past fifteen years, especially if there is an outage issue, but yea, some of my interactions over pricing and billing are similar to this guy's experience. Fred Pilot over at Eldo Telecom has made a good point: that Gigabit fiber is changing the telecom landscape. More and more communities are making investments to bring Gig fiber to downtown areas, business parks, and schools, and a wave of CLECs are also making similar private sector investments. The Google Fiber initiative's primary contribution has been to legitimize Gig fiber. Prior to the Google project in Kansas City, those of us talking about Gigabit connectivity were often just looked at as kooks. Now Gig fiber is mainstream, as it should be. The focus on Gigabit services is putting pressure on the copper-based incumbents and creating new opportunities in both the private and public sector for new modern networks. And that is a good thing. For many households, the WiFi router is probably an item regarded with a mixture of dread and fear. Once you get the thing configured properly, you generally tend to forget about it...except when the Internet stops working. Then the FUD (Fear, Uncertainty, Doubt) takes over the lizard part of your brain...and your first step is stare at the wretched device, hoping that somehow, the gods of the Internet will just magically get the Internet back on so you can continue sorting your Netflix DVD list and posting what you just ate to Facebook. A new wireless home router called Soap started out as an Internet filtering device ("cleaning" the Internet for families), but as the product was developed, more features were added to provide a higher level of integration. Unlike every other wireless router on the planet, Soap has a touchscreen interface to help simplify configuring it--no more really bad Web-based control screens that only a Unix geek could love. Soap also understands a wide variety of wireless protocols that allows it to talk to the rapidly expanding market of home automation devices. This may turn out to be its best feature if it works well. I have been interested in the home automation market for a long time, and have always thought that the biggest challenge is integration and interface. If every device manufacturer makes buyers use a poorly designed one-off interface, homeowners will be quickly overwhelmed and frustrated at the effort involved in configuring and managing many different "smart" (or dumb) devices. If Soap delivers on the interface and configuration features, it will force massive changes in the wireless router market. What does this have to do with fiber? Some Fiber To The Home equipment manufacturers are integrating WiFi routers into the fiber interface equipment. But the utility of a device like Soap far out-strips anything that can be built into a fiber interface. "The surprising news is that AT&T fiber-based U-verse has lower performance than many DSL ISPs, such as Frontier, CenturyLink & Windstream..."
This was in a letter from the CEO of Netflix, Reed Hastings, to stockholders. While this little spat between AT&T and Netflix is amusing, it highlights the vast divide between incumbent attitudes about what constitutes good service and what the customers of those incumbents regard as good service. The incumbents believe that good service is whatever they decide they want to give their monopoly-captive customers, while the customers think good service is being able to use Over The Top (OTT) services like Netflix without constant stuttering, re-buffering, and stalling out. I mentioned this in an earlier post, but I was recently in a community that told me no one wants to live there anymore because of poor Internet service from the incumbent phone and cable companies. It's created an economic development crisis, because senior business managers that are being brought by existing companies in the town are choosing to live hours south of the community. And to make things worse, those same existing businesses are saying they can't expand and add jobs because their business Internet service won't support expansion. Communities are at a crossroads: You can let the incumbent providers decide your economic development growth potential, or you can take control of your future and make some basic investments in competitive broadband infrastructure. Amazon announced yesterday their "Fire TV" product, which is a $99 Internet to TV box that follows in the footsteps of Apple TV, Roku boxes, and Google Chromecast. All of these products connect directly to a late model TV and give you easy access to a wide variety of Internet-based content. The Amazon Fire offers Netflix, Hulu, NBA, AOL, Showtime, iHeart radio, Amazon Prime shows and movies, and Pandora, among other offerings. The box also gives you access to Amazon cloud storage for your own pictures and videos. In terms of competing boxes, the Fire TV probably comes closest to the Apple TV box, which offers direct access to the iTunes store (movies, TV, music) and Apple's iCloud personal storage service. I remain kind of ho-hum about all these devices, because I can access all the same stuff right on my computer at home, and simply watch the content on a large screen monitor. I have a hard time getting excited about a box that duplicates what I already have. But these boxes can deliver higher quality video, and if you have a large screen TV that you want to use for entertainment, these boxes deliver a lot of value. I dumped my cable subscription years ago, but even with Netflix, Amazon Prime, and Hulu subscriptions, I just don't watch much TV...perhaps a couple of hours a week at most. I see two significant things with this announcement. First, Amazon continues to deliver incredible value to its customers, and this box really ties together their other services like Prime video and cloud storage. This puts pressure on Apple, Google, and Microsoft to offer more and better products--always a very good thing. Second, it is getting easier and easier to cut the cable/satellite TV subscription. Comcast seems to have finally begun to agree with me that the old cable TV model is about dead, and is more focused on delivering improved Internet access to its customers. But a monopoly is a monopoly, and even if you save money in the short term by dumping your TV subscription, expect the cable companies to keep increasing their fees for Internet...because they can. Comcast and Time Warner have agreed to merge, with Comcast buying Time Warner. Although this merger has to be approved by Federal regulators, the article suggests that since the two companies don't have overlapping territories, it may well be approved. The merger would combine Comcast's 22 million subscribers with Time Warner's 11 million subs, and Comcast has said it would sell off 3 million subscribers to keep the new company below 30 million customers. Supposedly that is some threshold that determines if the company will have too big an influence on the market. The lack of bandwidth is killing our Main Street businesses. No one can work from home because the bandwidth available is too limited. We are having a hard time attracting families because services like Netflix and Hulu are unusuable, and the kids are revolting. Aside from the fact that copper-based coaxial cable is grossly inferior to fiber, the cable companies simply can't provide business class symmetric services over their "entertainment" networks in any sort of consistent way, and they know it. So they are going to merge to give them market clout on the content side, and they are going to continue to try to buy laws at the state level, like they just tried in Kansas. In less than ten years, most American homes will have fiber. It is as inevitable as flush toilets, which were once considered a luxury. And when the dust settles, the communities that introduced competition by creating shared digital road systems are going to be doing much better economically. In the nineties, as the Internet became more popular, there was a long-running and often tedious discussion of what the "killer app" was going to be that would make everyone get Internet access. I always thought the whole discussion was a waste of time, because it was obvious to me that at that time, email WAS the killer app. People signed up for Internet access because they recognized the value of email for business use, personal use, or both. There is a similar discussion underway for broadband and particularly broadband over fiber (i.e. 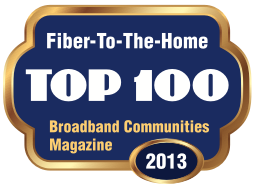 fiber to the home). I think it will be health services and applications. The Internet has already begun to disrupt the way health services are delivered, but we have barely begun to see what is possible. Today, services like Fitnet provide personalized interactive work out sessions, along with related products like the Nike collaboration with Apple that tracks runners and joggers. Apple watchers suspect that the company is going to roll out sophisticated new apps for both iPhones and Macs. Other companies are preparing to offer doctor visits via HD webcam-enabled software, and if companies like Apple lower the cost of sensors that monitor your health (e.g. blood oxygen levels, heart rate, blood sugar and insulin levels) we could see significant changes in the way health care is provided. The most potential is for improvements in the management of chronic health problems like diabetes and heart disease, where the ability of low cost sensor to provide hourly and daily monitoring of key information could lead to early diagnosis and better treatment. Most of these services are going to require a broadband connection, and cutting out just one $80 copay for a doctor visit per month will easily cover the cost of a fiber connection to the residence. Communities with aging populations and/or are desirable retirement locations will want fiber everywhere to deliver health care services where they are needed. A new report illustrates just how dire the situation is for the cable companies; Netflix and YouTube use half of all the bandwidth on the Internet. Cable TV is brain dead, but the body is still on life support. There is no future in cable, and satellite will be the next to go as more fiber is deployed into areas unserved by cable. This is not a matter of "if" anymore, it's all about the "when." I think it is safe to say that most of the country will have fiber connections by 2025. I've been talking about this for fifteen years. New data, from an article at Forbes, suggests that demand for office space may have peaked in the U.S, and that what may be the trend in the future is work from home and business from home activities. According to the article, the number of people working from home as self-employed has risen 14% in the past decade. Neighborhoods are business districts, and need to be treated as such by economic developers. This means that you want to be able to deliver business class high performance affordable broadband into your neighborhoods, and that generally means you want fiber, with business class symmetric service available. Places like FastRoads in rural New Hampshire are already doing this (a Design Nine project), and not surprisingly, a lot of homes (er, business locations) are signing up for 50 meg service--well beyond what cable and DSL is able to offer in most places. It's not that communities should stop paying attention to downtowns and business parks....just the opposite. But if your community's economic development strategy does not have goals and objectives focused on supporting neighborhoods as business districts, you are missing some business attraction and job creation opportunities.